Sometimes it is difficult admire the beauty of a lone tree amid a vast forest. This can also be the case when viewing a beautifully engraved stamp vignette with an elaborate border. It is true, of course, that the border should compliment the vignette, but I find it a bit of fun and quite interesting to separate the relative parts. I do this with the use of basic editing software. There are loads of editing software packages out there, and different people have their own preferences. I personally use Paint.net. But enough of that. On with the show, as it were! A great specimen to use for an exercise such as this is the France 1950 1,000f airmail stamp. Not only does it have a stunning vignette and lovely decorative border, each aspect of the design had a different engraver. This enables us to single out the vision of each engraver. It is true that I have already written a blog studying this stamp and the other stamps in this series - click HERE. But by employing the method mentioned above, hopefully we will see this stamp in a whole different light. And if not, it was a bit of fun. First, let's take a look at the entire stamp. Now let's manipulate the image a bit so we can focus solely on the vignette (central grey portion). 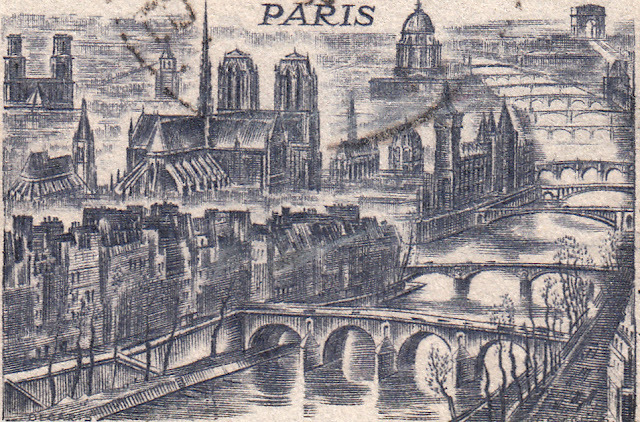 This part of the stamp was designed and engraved by Albert Decaris. There is instantly a different feel to the image. A smoky, dark presence yet an alluring quality that beckons us down into the design. To roam the narrow streets of Île de la Cité. To traverse the gorgeous, uniquely-styled bridges. To explore the stunning Cathedral of Notre Dame. Vraiment superbe! It was actually only recently that I realised that the border of this stamp was not designed and engraved by Decaris. 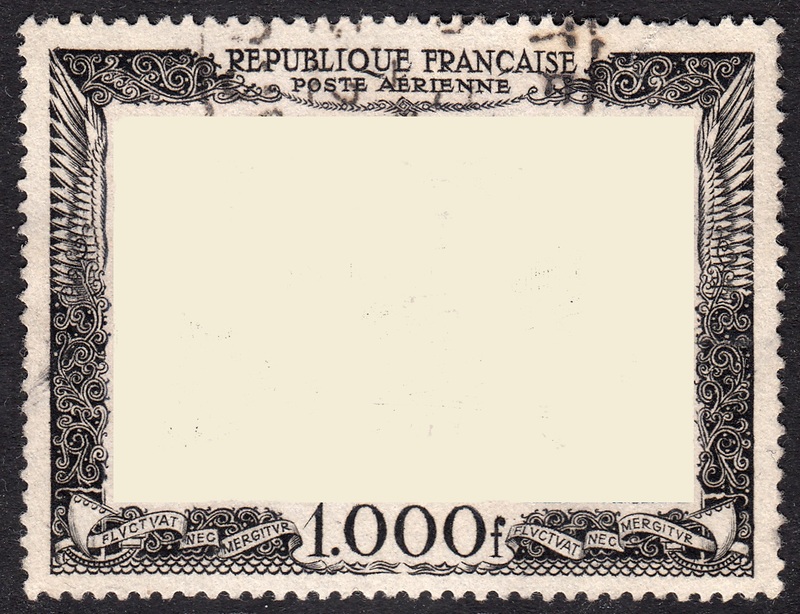 This magnificent border was entrusted to Jacques Combet. Let's take a look at it with the vignette removed. The fine details sculpted into this border are quite amazing! The feathered wings down each side of the border. The intricate scrollwork. I particularly like the sailing vessels to be found at each corner! This border is a stunning piece of art in and of itself. Incidentally, this was not the only time these two engravers collaborated. 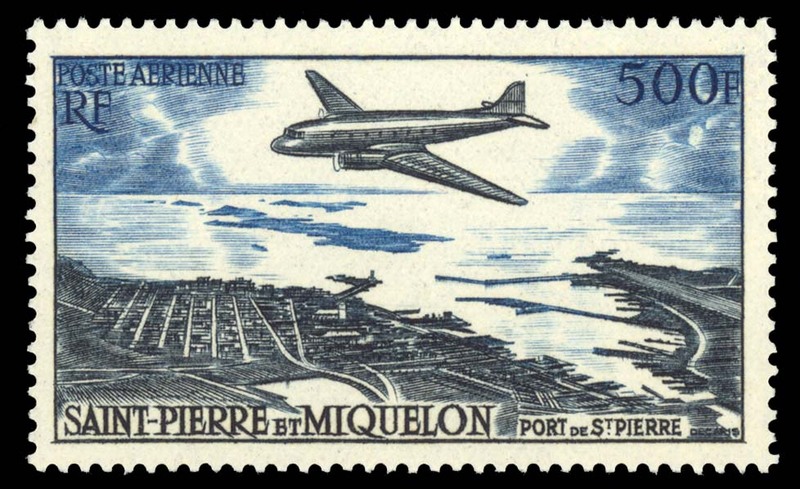 In 1956 their talents were again combined to produce the 500f airmail stamp for St. Pierre et Miquelon, depicting a Douglas DC-3 over St Pierre Port. I believe Decaris was responsible for most of the work in this stamp and Combet engraved the lettering. 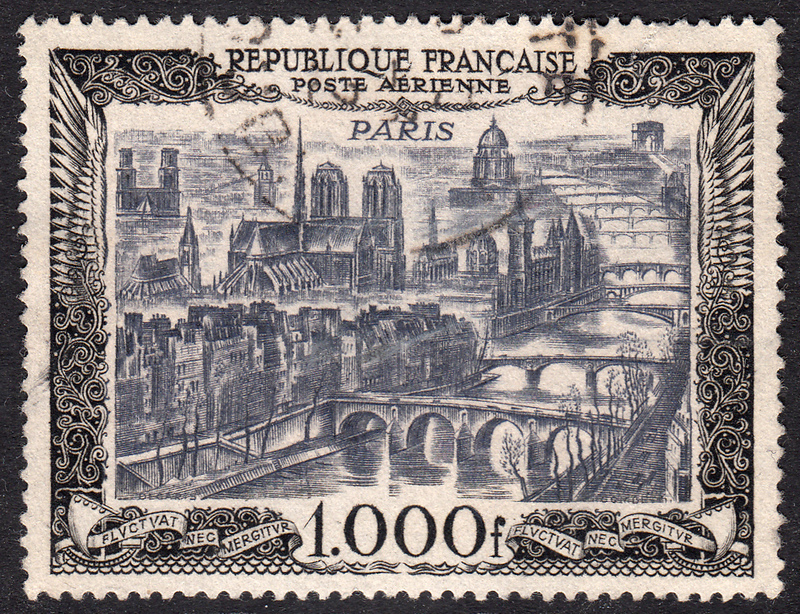 Many thanks to Adrian at Stamp Engravers for his blog on this issue. To take a look at his blog post click HERE. It's well worth the read. Anywho, enough from me for now. I hope you enjoyed this little exercise! What's the point of computers and all this fangled software if we can't play around with it from time to time?